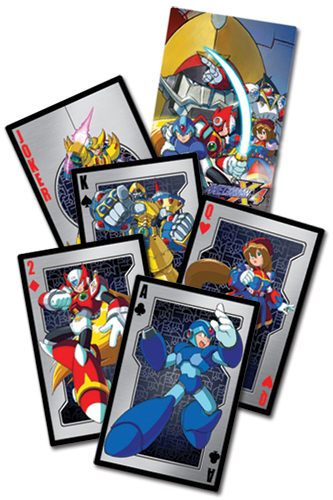 Rockman Corner: X4 Playing Cards? X4 Playing Cards. X4 Playing Cards? X4 Playing Cards. It appears Hot Topic, and perhaps others, will be selling officially licensed decks of Mega Man X4-themed playing cards later this Fall. Now you too can enjoy a game of poker with the likes of X the Ace, General the King, and Iris the Queen. Yes, I miss news of real Mega Man games too. GE Animation, the folks behind a number of misc. Mega Man merchandise as of late, intend to release the cards to specialty retailers on September 15, priced at $5.99. Characters revealed thus far are X, Zero, Maverick Double, the General and Iris. Wouldn't be too surprised to see Colonel and a few Mavericks thrown into the mix. GE has been on a bit of a merchandising blitz lately, slapping Mega's face onto practically everything. I highly doubt these playing cards will be the last of random merchandise they put out... almost makes me wonder what's next. Underwear? Yeah... yeah, I could go for that. That looks like X5 Zero and X. See Mega Man is still an important "brand" as long as hipsters at Hot Topic buy this junk up Capcom will always consider it an important "brand". One question, WHY X4? Why not MHX or X8? X4 is really old, but not nostalgia old. So this is a weird move. Why would you want X8 merchandise with the ugly X redesign? Okay, yeah, I got the Mega Man X GCN controller, but it's more of a series product that just happened to (unfortunately) have X8 X on it. Now Maverick Hunter, that's a good choice. Classic X with all the necessary design evolution that lead up to the quintessential X. Sorry, X8 fans, but that design just looks so strange. Even Command Mission's bizarre look still has the general feel of X. Come to think of it, I'd actually put up a defense of using the X4 designs if they actually use the X4 logo. It's really neat to see merchandise from franchises as icon as Mega Man actually use specific logos from specific games. @turianx9: Weird move? Capcom IS weird. Nuff said. But is there enough character artwork from X4 for all 54 cards? If it's only X4, (8 bosses, X, Zero, Iris, Colonel, General, Double's 2 forms, Sigma's first two forms) the remaining ones must be Zeroes and Xs, both normal and with armors and Rider Chaser/Armor. Funny how the cards are spot on too. general is King, X is Ace, Zero is a 2, (red of course)iris queen, and Double is Joker. Im calling it- Colonel will be the Jack. I cant quite imagine Sigma though. Either another Ace, or another King. @ X4 because it's the best X game. It DOES have nostalgic value because its the last X game to follow the X1-X3 style, before X5 made the world, environments and story more complex and added more characters besides just X and Zero. Also, X8 X isnt really that bad. The only BAD design in X8 is Zero. His is just unforgivable. lol@people who call X4 the best X game. I did like X4, but again I'm also not sure why this game specifically was used for the cards. It's not a bad move as it was a very good game, just an odd move. Ah well, who knows what they are thinking. Oh, and I wish Dr. Cain would appear on the cards. X4 was the last game he was mentioned in, after all, even if only in the manual. I think they should have made Star Force 3 cards! After all, the whole game is based on cards. I would wear megaman underwear with pride. Except X7 had exactly the same designs as X4,5 and 6.